We walk across the bridge in single file, not shoulder to shoulder as the marchers did in 1865. And we take the sidewalk, not the traffic lanes. And we’re greeted by a super-friendly local named Columbus, not state police with riot gear and batons. 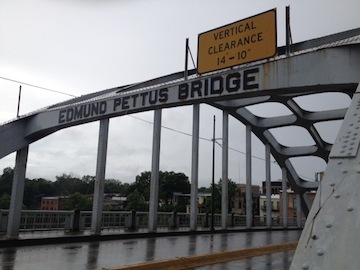 But our trip across the Edmund Pettus Bridge in Selma, Alabama, is exciting for me nonetheless. Here, on March 7, 1965, Civil Rights marchers were set upon by Alabama State Police and a deputized posse. 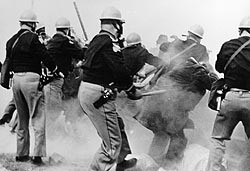 Seventeen protestors were hospitalized and another 50 injured, earning the incident the infamous nickname “Bloody Sunday.” It was the first of several marches that eventually led to voting rights reforms that restored the franchise to millions. The recent movie Selma has sent thousands of people to the small Alabama town, but I’ve wanted to visit for years. I first became interested in the story here when, years ago, I taught a freshmen class called “Intro to Mass Media.” As part of the course, I used the Bloody Sunday march as an example of the power of media to call attention to issues. Pictures of the police brutality were picked up by the media, suddenly catapulting the story into the national spotlight. The resulting national outrage energized the protest efforts and, ultimately, led to the nation Voting Rights Act in August. We park at the Voting Rights Memorial Park at the south end of the bridge and, after a visit to the monuments there, we file across the bridge. I literally get goosebumps. In a way, this is similar to the walk Dan and I do every year at Spotsylvania when we walk in Emory Upton’s footsteps on May 10. That walk is a form of commemoration, just as this one is. 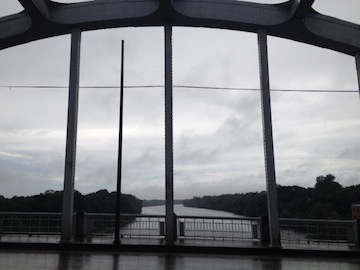 The bridge is named for Edmund Pettus, a former Confederate brigadier general who later went to serve as a U.S. Senator from Alabama and a leader in the KKK. In 2013, it was named a national historic landmark. The view across the Alabama River is stunning, particularly as we look westward. Eastward, the backside of Selma, backed against the river, doesn’t look too attractive. 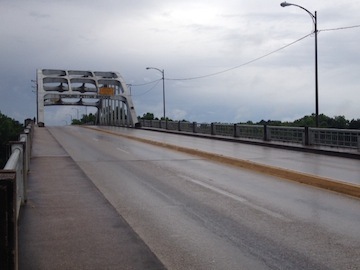 In fact, much of Selma looks deserted and run down. It’s not a destination town, which might explain why things as so quiet, even in the NPS visitor center we find on the far end of the bridge. The NPS offers interpretation for the full route of march, plus it offers info on the entire Voting Rights struggle, including Bloody Sunday, Turnaround Tuesday, and other related events. As I’ve said, the NPS’s “Civil War to Civil Rights” theme has felt forced at times, but I got to experience it literally today. From Jefferson Davis’s inauguration, history literally led here to Selma just over 100 years later–just as did today. And the marchers went from here back to that same site in an effort to call attention their cause. It was an honor to walk in those footsteps, and it was exciting to take that kind of trip through history. My walk has helped me better appreciate it all. This entry was posted in Battlefields & Historic Places, Ties to the War and tagged Alabama, Bloody Sunday, civil rights, Civil War Trip 2015, Montgomery, Selma. Bookmark the permalink.